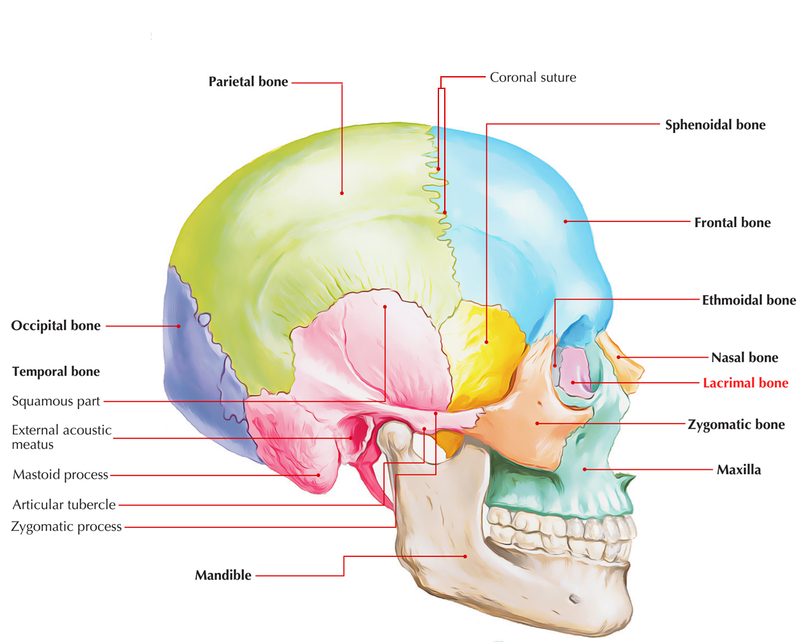 The lacrimal bone a.k.a. os lacrimale is quadrangular and it is the smallest of all bones of the skull. In relation to development, the lacrimal bone is basic as it goes through two stages of development and is created with connective tissue at its center. The lacrimal bones possess two surfaces as well as four borders. Along with an anterior fossa for lacrimal sac as well as lacrimal hamulus which creates the upper orifice of the nasolacrimal canal with the maxilla, the lateral orbital surface is separated via a vertical posterior lacrimal crest. The medial nasal surface is part of the middle meatus and connects with the anterior ethmoidal air cells. The superior border connects with the frontal bone and inferiorly connects with the maxillary orbital surface. The anterior border joins with the frontal process of the maxilla at the lacrimomaxillary suture, while the posterior border joins with the ethmoidal orbital plate. A vertical ridge called the posterior lacrimal crest separates the lateral or orbital surface in two parts. A longitudinal groove known as the lacrimal sulcus (sulcus lacrimalis) is located in front of this crest, the inner margin of which combines with the frontal process of the maxilla, and completes the formation lacrimal fossa. The upper part of this fossa gives attachment to the lacrimal sac and the lower part gives attachment to the nasolacrimal duct. The portion is smooth behind the crest as well as creates portion of the medial wall of the orbit. The crest along with a part of the orbital surface is located immediately behind it and the lacrimal part of the Orbicularis oculi originates from it and terminates below, in the lacrimal hamulus which is a small hook-like projection, which articulates with the lacrimal tubercle of the maxilla, and completes the upper orifice of the nasolacrimal canal. The hamulus is occasionally found as a separate section and then it is known as the lesser lacrimal bone. Equivalent to the crest on the lateral surface, the medial or nasal surface has a longitudinal trough. Part of the middle meatus of the nose is created by the area in front of this furrow; which at the back of it joins with the ethmoid, and concludes some of the anterior ethmoidal cells. The anterior joins with the frontal process of the maxilla. The posterior with the lamina papyracea of the ethmoid. The superior with the frontal bone. The inferior is divided by the lower edge of the posterior lacrimal crest into two parts. The posterior part joins the orbital plate of the maxilla. As the descending process, the anterior is extended downward, which joins with the lacrimal process of the inferior nasal concha, and helps in creating the canal for the nasolacrimal duct. The ossification of lacrimal is carried out from a single center in the membrane enclosing the cartilaginous nasal capsule which appears around the twelfth week.